TOMRA Sorting can help you sort the contaminants out of wood. The effluent to be treated from wood industries has high loads with elevated contents of solid matter. Companies in this industry often operate in sensitive and protected environments. We are able to provide the forestry industry with high treatment performance that produces effluent safe for discharge into delicate eco systems. We provide explosion protection for wood processing factories where wood waste and dust pose a hazard. 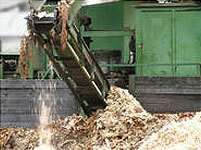 Various wood processing technologies show that flammable wood waste or dust accumulates in these facilities. In terms of evaluating the risk of explosion, finely sedimented dust is hazardous and in the event that this finely sedimented dust suspends and is connected to an ignition source, and explosion will occur. By RSBP spol. s r. o. based in Ostrava, CZECH REPUBLIC. Wood is presenting in various forms: wooden pallets, furniture scraps, old furnitures, ecc.. SA Eng propose for that kind of products, systems foreseeing a first volume reduction, the separation from possible ferrous parts contained in the shredded material and a final refining to get the required final size. By SA Eng. based in San Donà di Piave, ITALY. By Advanced Plasma Power (APP) based in Swindon, UNITED KINGDOM.